"Best Welsh Wine in the Competition"
Our Dathliad Sparkling was awarded the "Best Welsh Wine in the Competition" trophy at the English & Welsh Wine of the Year Competition 2016. Click here for more information, and to see our growing list of awards. Parva Farm is a privately owned and run vineyard in the village of Tintern, South Wales. The farm is tended by its owners, Judith and Colin Dudley. The farm is open year-round for visiting - drop by and enjoy a tour of the vineyard and a chance to try the range of Welsh wine. 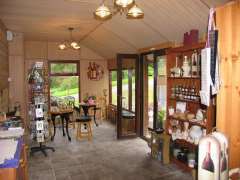 Our farm shop sells not only wines, but also offers meads, cider & perry, honey, preserves, and much more. It also incorporates an indoor tasting area. Enjoy a guided tour of the vineyard followed by a tutored wine tasting! We were awarded "Best Food Tourism" business in the Monmouthshire Business Awards 2013!